The MK 14 was the primary submarine-launched, anti-surface ship torpedo of World War II before the introduction of the electric MK 18. 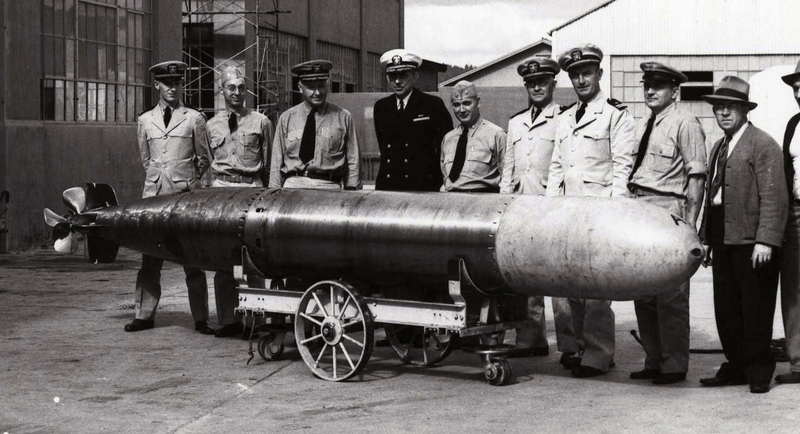 Initially considered problematic and unreliable, the MK 14 torpedo became the most effective, destructive U.S. Naval weapon of the war after flaws with its successive exploders were addressed. In 1930, the Naval Torpedo Station (NTS) at Newport, RI, was tasked with designing three new torpedoes: the MK 13 for aircraft use, the MK 14 for submarines, and the MK 15 for destroyers. With a paltry R&D budget of about $50,000 per year, NTS was forced to take an economical approach to their development. Engineers established a common technology base based on the MK 12 torpedo. The development cycle for all three torpedoes was also simplified by using steam turbine power plants, a compressed air and alcohol combustion system, a common depth and course control system, and similar exploders. NTS managed to develop the three torpedoes for an impressive R&D cost of $200,000, less than $70,000 per torpedo. Most evaluations with the new designs were performed with exercise torpedoes to reduce costs; testing of warshot torpedoes, especially against real targets, was almost nonexistent. 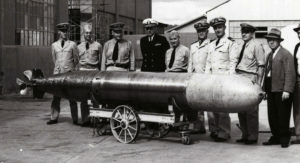 The MK 14 was created to replace the aging MK 10 torpedo; NTS retained the same 21-inch diameter but added 50 inches to the new torpedo’s length. It also employed the secret MK 6 magnetic influence exploder, developed in highly classified project G-53, in place of the typical MK 5 contact exploder. Initially conceived with three speeds, the final design specified a dual-speed torpedo to maximize production rate. The MK 14 underwent very limited testing on the Navy’s new Salmon, Plunger, Tambor, and Gato class submarines, with their longer torpedo tubes. In addition to the testing constraints imposed by budgetary shortcomings, fears of depleting the meager pre-war store of MK 14 torpedoes also prevented warshot tests. U.S. entry into World War II exposed major failings with the warshot configurations of the MK 13, 14, and 15. For one, they ran deeper than the set depth because the warheads were heavier than exercise heads; supplying the fleet with new depth calibrations corrected this issue. A more complicated problem was the frequent malfunction of the exploders: the MK 14, with its MK 6 magnetic exploder, was detonating prematurely — as much as 50 feet from a target. The submarine force switched to the contact exploder while a crash program was undertaken to improve the MK 6. Its performance was successfully enhanced, but the submarine force had had enough of magnetic exploders and chose to continue using the contact exploders. Unfortunately, the shift to contact exploders created a new problem: duds. Testing confirmed this issue and revealed that while the exploder worked correctly with glancing or angled hits, a direct hit would bend the firing pin, incapacitating the exploder. Two solutions, a lighter firing pin and a heavier firing pin spring, were recommended, and by fall 1943, after a year and a half of frantic efforts to correct warshot problems, the MK 14 was finally functioning satisfactorily. Approximately 13,000 MK 14 torpedoes were manufactured during the war years; the majority of these were Mod 3 torpedoes designed to operate with mechanical fire control systems. After the war, they were modified to work with modern, electrically-controlled fire control systems. These torpedoes, designated MK 14 Mod 5, continued to be used by the Submarine Force even after the introduction of the MK 18. MK 14 Mod 5 torpedoes were eventually phased out in the 1970s with the introduction of the MK 48.